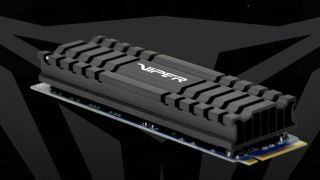 Patriot Viper Gaming has launched a new PCIe NVMe SSD for gamers, and it has performance specs that could put it in the running for best solid state drives. The Viper VPN100 SSD has a new controller from Phison that's boosting its speeds, and it's available today, Tom's Hardware reports. The 1TB model of the VPN100 boasts 3,450MB/s sequential read speeds and 3,000MB/s sequential write speeds. It's 4K random read and write performance hits up to 600,000 IOPS for both. Just how fast is it? For comparison, those speeds put it in the same ballpark as our current top SSD pick, the Samsung 970 Evo Plus, and our top gaming SSD, the WD Black SN750. The Viper VPN100's 600,000 IOPS in both random read and write tops both the Samsung and Western Digital SSDs. However, its sequential read speed is below the 3,500MB/s of the 970 Evo Plus and the 3,470MB/s of the Black SN750. It's sequential write speed matches the WD drive, but Samsung edges both out with 3,300MB/s. All that said, the 1TB Viper VPN100 costs just $199 (about £150, AU$275) and comes with a heatsink. That prices it below the competing 1TB drives, so Patriot could be bringing them some serious competition.